During the past couple of years, Taurus International has introduced several innovative and useful handguns, and there is no sign that they are letting up. 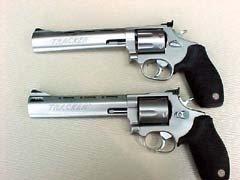 The year 2002 industry awards for manufacturer of the year have been bestowed upon Taurus for their willingness to listen to what shooters want, and then filling that need quickly with quality products. One of their latest products is the new Tracker revolver chambered for the newest rimfire cartridge on the market, the .17 Hornady Magnum Rimfire. The .17 HMR has taken the rifle market by storm, and was reviewed here on Gunblast.com a few months ago in the excellent Ruger model 77/17 bolt action rifle. Since then, many rifle manufacturers have introduced their own rifles in .17 HMR, and Ruger is bringing out their handy little model 96 lever action chambered for the fast-stepping little rimfire. At the 2002 SHOT Show in Las Vegas, Taurus unveiled their compact but hefty little Tracker in caliber .17 HMR, and it immediately drew a crowd. About a month ago, we received a production gun here at Gunblast.com for testing, and since then, I have sent many rounds of Hornady’s ammo through the bore of the test gun. The new .17 HMR Tracker looks, handles, and feels much like the .45 ACP Tracker reviewed here a couple of months ago. I was impressed with the accuracy of the .45, and was expecting the same good accuracy from the .17HMR. 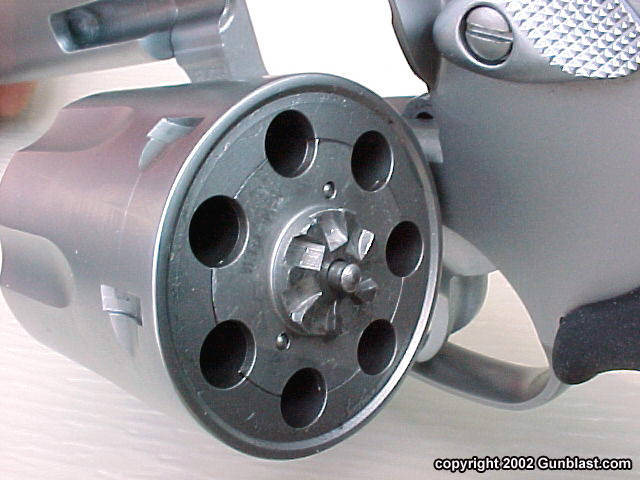 The barrel of the .17 is not ported, as on the .45 Tracker, as there is no need. 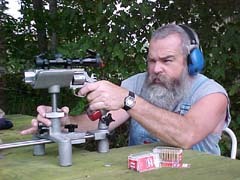 The recoil of the .17 HMR is minimal. The .17 wears the same excellent open sights as the .45, and also wears the Taurus Ribber synthetic grip. 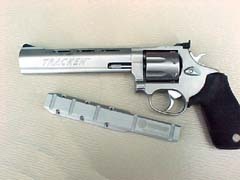 The sample .17 Tracker has a seven shot cylinder with offset bolt notches, a heavy full-underlug barrel with a ventilated rib, and is constructed primarily of stainless steel. 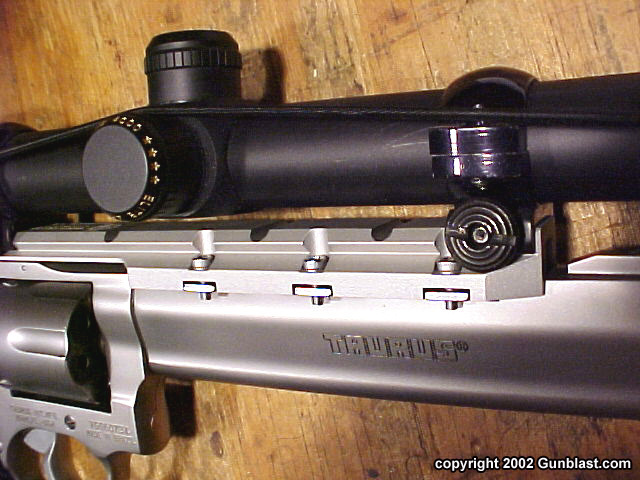 Taurus uses the vents in the barrel top rib for attaching their excellent scope mount. 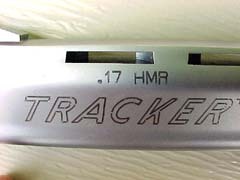 The .17 Tracker weighs in at 41 ounces as shipped, without the scope mount. 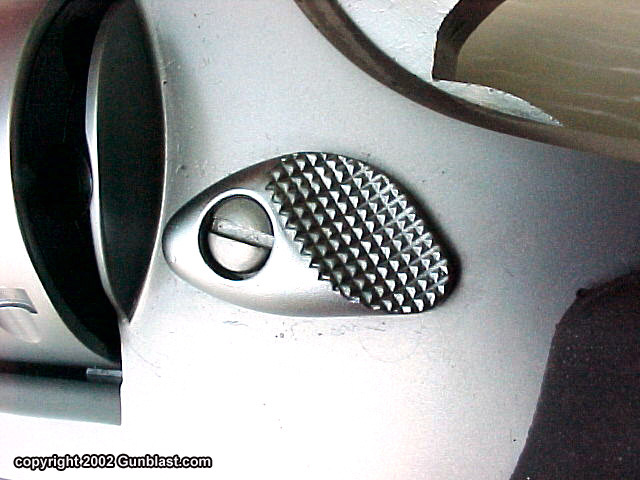 The revolver also has the Taurus Security System which locks the action, if one chooses to do so, but is otherwise unobtrusive and easily ignored, and comes supplied with two keys for the locking system. 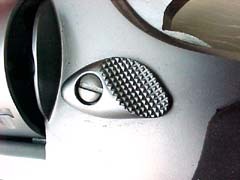 Another nice touch is the smoothly sculpted cylinder release latch, which is a great improvement upon the ones supplied on most double action revolvers on the market. 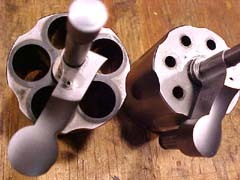 The double action pull measured a smooth ten pounds and two ounces, and the single action pull measured a crisp five and one-half pounds. 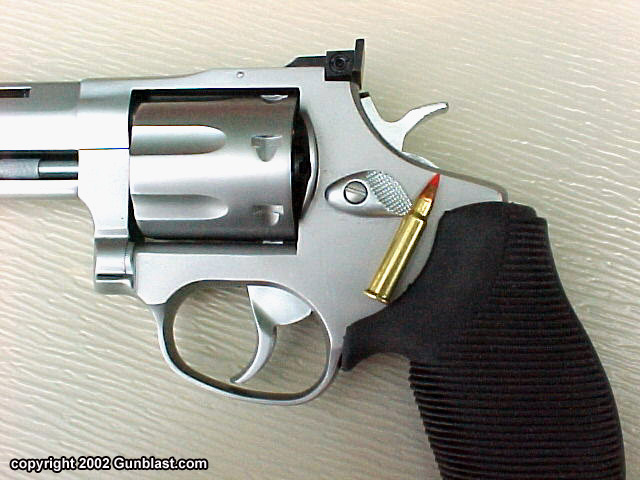 I prefer a bit lighter single action pull on a hunting revolver, but this is easily remedied by a competent gunsmith. After much examining, photographing, and fondling of the little Tracker, I gathered a supply of Hornady .17 ammunition and proceeded with the task of shooting at rocks, cans, fruit, and other targets of opportunity. Hey, somebody has to do it. After the fun stuff, I mounted a Charles Daly two power scope on the Taurus base and commenced with the accuracy testing. I test fired the .17 Tracker at ranges out to 100 yards for accuracy and over the sky screens of my PACT chronograph at twelve feet. Out of the six and one-half inch barrel, the Hornady seventeen grain V-Max bullet averaged 2168 feet-per-second. Sighted in at a range of 125 yards, the flight path is very flat for a rimfire. 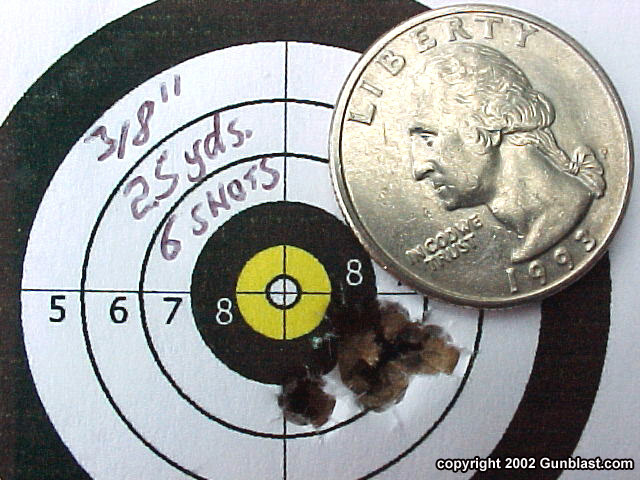 The bullet is only 1.43 inches high at 75 yards, and drops only 2.06 inches below the line of sight at 150 yards. This allows a varmint hunter to hold dead on a crow or other small varmint out to about 165 yards, a range at which the bullet is still traveling faster than a .22 Magnum is at the muzzle of a revolver. 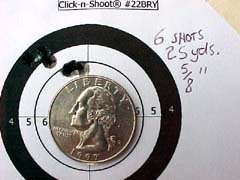 That is very flat-shooting performance from a rimfire varmint gun! As I had expected, the .17 HMR Tracker displayed excellent accuracy. At a range of 25 yards, the worst group fired measured only five-eighths of an inch for six shots. The best group sent six shots into a tiny three-eighths of an inch group. The best that I could manage at 100 yards was one and one-eighth inch groups. In fact, every group fired at 100 yards measured the same one and one-eighth inches, which is outstanding accuracy from a revolver. 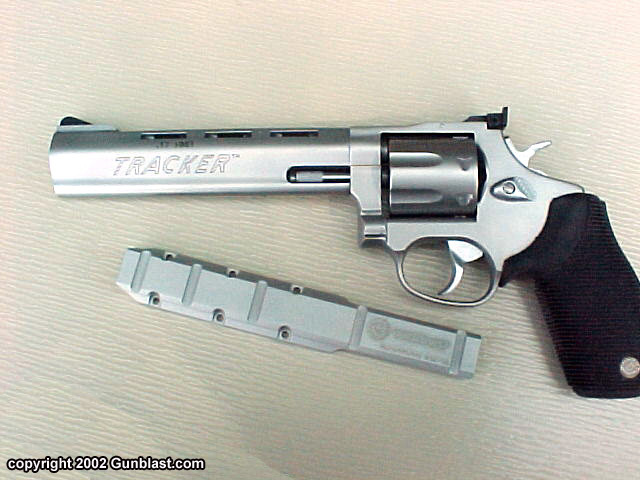 There were no failures of any kind with the Tracker or the Hornady ammunition, and extraction was easy and positive. Once again, the fine folks at Taurus International have shown their willingness and ability to give shooters innovative firearms that are accurate, practical, and just plain fun! Taurus also offers a free one-year NRA membership with the purchase of the handgun, and backs it with a Lifetime Repair Policy. 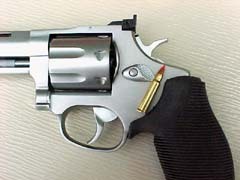 Look to Gunblast.com for upcoming articles on other fine guns from Taurus International. Just a couple of days ago, I received a fine looking .218 Bee Silhouette model, and other guns are on the way. Unlike some magazines, we won’t review a gun until we shoot it, but you will most likely see it here first. All content © 2002 GunBlast.com. All rights reserved. Taurus International is offering a new version of their excellent Tracker DA revolver chambered for the equally-excellent .17 Hornady Magnum Rimfire. Shown with its cousin, the Tracker .45 ACP (at bottom in the top picture), the .17 HMR Tracker is a well-made, accurate seven-shooter. 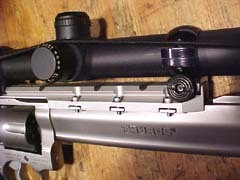 The Taurus .17 HMR Tracker features Taurus' scope mount system, which uses the vent slots in the barrel rib as mounting points. 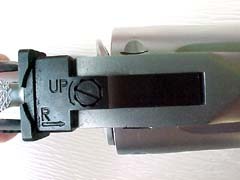 This is a very stable and well-designed system that easily and reliably returns to zero when the mount is removed and re-installed. 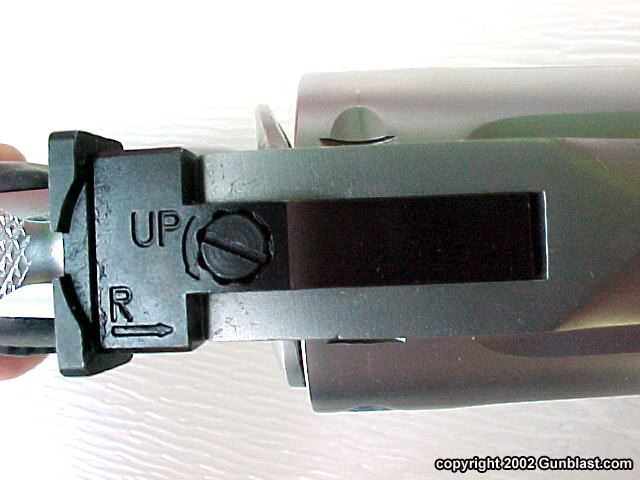 The iron sights on the .17 HMR Tracker consist of a fully-adjustable rear and red-ramp front. Adjustments are positive and accurate. 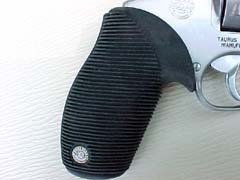 Taurus' "Ribber" grip, standard on the Tracker, offers great ergonomics and positive purchase. Taurus takes full advantage of the diminutive .17 HMR, allowing a seven-shot cylinder with plenty of "beef" between the chambers. 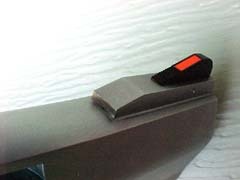 The smoothly-sculpted cylinder release is among the best the author has seen on a production gun. The Taurus .17 HMR Tracker proved to be superbly accurate. The worst 6-shot group at 25 yards measured a scant 5/8 of an inch. The best 6-shot group at 25 yards measured a mere 3/8 of an inch! This excellent accuracy was also evident at 100 yards, where all groups fired measured 1-1/8" for six shots. Author has been very taken with the .17 HMR cartridge, and the Taurus .17 HMR Tracker is a fine platform for its expansion into the handgun realm. Jeff considers this combination to be just about perfect for small vermin and pests out to 175 yards. Taurus has done it again!